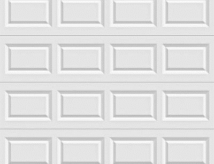 Short, Long and Ribbed panel steel garage doors. Non Insulated with 24 or 25 gauge face skins available. Steel skins are protected through a tough, layered coating system, including a hot-dipped galvanized layer and baked-on primer and top coat. Five factory finish paint colors available. Many glass options available including insulated options. Grilles are removable for easy cleaning.